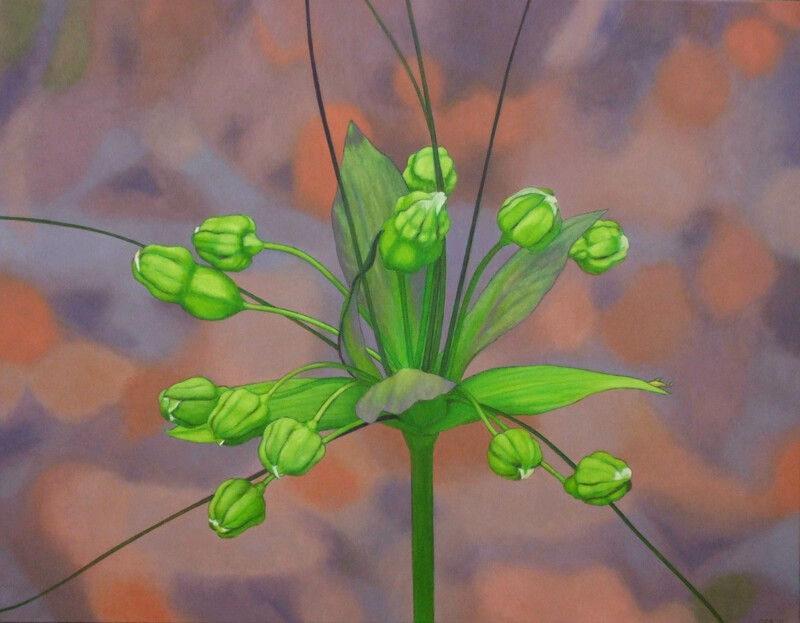 January – Tacca 1, [ Tacca leontopetaloides ], 70x90cm,oil on cotton. Family: Taccaceae. Stemless herb, generally 0.5 to 1 metre high, perennial underground tuber. Dies down in the Dry Season, grows vigorously in the Wet. Large compound leaves, dark green and glossy. Numerous terminal umbels surrounded by large greenish or yellowish bracts often with purple flecks, other bracts hairlike, to 25cm long. Small flowers open at night. Grows in coastal regions or in monsoon vine thickets. May occur in plantings in conjuction with tamarind trees on the islands off the western Arhemland coast, where it was cultivated in historical times by Macassan trepang fishermen. Fruit and roots eaten, the latter after extensive preparation. Polynesian arrowroot. Roots also used as a medicine. Related to the Malaysian Batflower, the Taccas are a pan-tropic species of vast distribution – northern Australia, Pacific Islands, Indonesia, Phillipines, South East Asia, India, Sri Lanka, and tropical Africa.